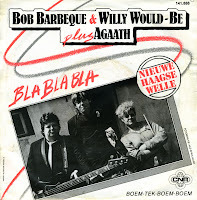 The illustrious trio Bob Barbeque, Willy Would-Be plus Agaath recorded a Dutch version of Trio's 'Da da da', entitled 'Bla bla bla'. In fact, it was a parody of the song, using the same song structure and melody but with entirely different lyrics, performed in the dialect of The Hague, one of the four big cities in the Netherlands. The single was released soon after Trio's original single, but it did not chart. According to some sources, the production company Cat Music was behind this release, the same group of people who were involved in the Dutch band Catapult in the Seventies and Rubberen Robbie in the Eighties.